I love ice creams what ever the weather be it summer or winter and for me its always the right time to eat ice cream any time of the year. I enjoy making all types of frozen delights at home, especially no churn ice cream, frozen yoghurts, fruit sorbets, ice lollies and popsicles on sticks for my little nieces and nephews that visit often. For the kids I do try and keep the ingredients healthy and one really easy way to create a healthy popsicle is to use yoghurts and fruits. 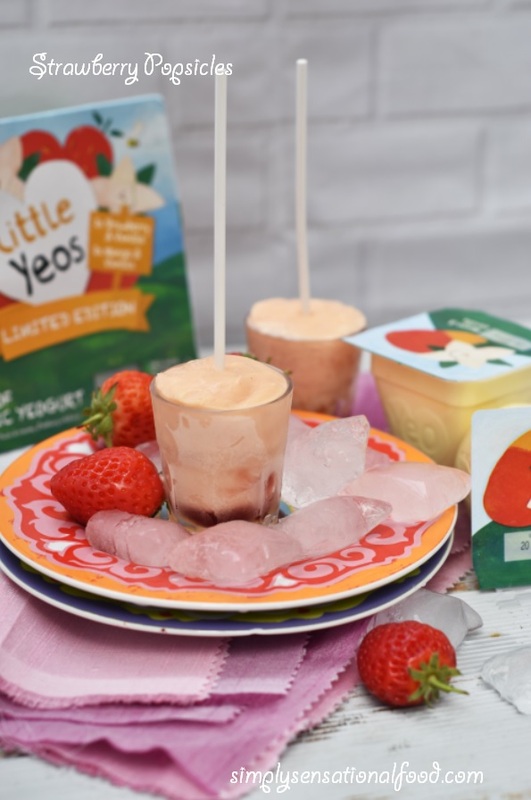 In this recipe I have used Yeo valley limited edition strawberry and vanilla yoghurts which are made from organic ingredients with very little sugar. In the Yeo vally range you can also get natural fromage frais and fruited fromage frais too. Both these products have no added refined sugars so they are great for kids. I have also used ready to serve custard to make my popsicles, but you can make your own custard at home if you wish. The beauty of these popsicles is that you can make them using any fruit and yoghurt flavour combination. Peaches work really well as do mangoes for these popsicles. They also work well if you add pureed fruits as a base and then top the fruit with the yoghurt mixture which you can see I have done in the popsicles I have made in the shot glasses. To make these just add pureed fruit in the base of the mould and freeze for 30 minutes, after which top up with the yoghurt mixture and freeze for three hours. 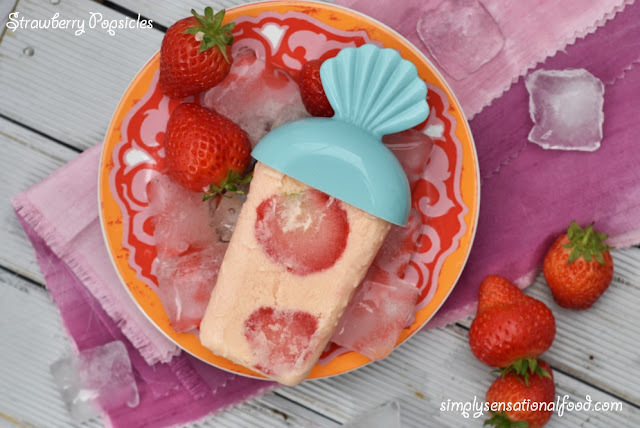 Strawberry frozen delights on sticks that are creamy and delicious. 1. Slice the strawberries and line the Popsicle moulds with them. Place the moulds in the freezer for 30 minutes so that the strawberries stick to the moulds. (this makes pouring the mixture easier into the moulds without the strawberries dislodging.2. In a food processor whisk up the custard with the agave nectar and strawberry essence.3. In another bowl tip out the Yeo valley strawberry and vanilla yoghurt and mix it together with a whisk.4. Fold the whisked yoghurt into the custard mixture. If you have any remaining strawberries cut them into smaller pieces and add to the mixture at this stage.5. Remove the popsicle moulds from the freezer and pour the mixture into the popsicle moulds. Tap the moulds to dislodge any air bubbles. Put the popsicle caps into the mixture and return the moulds to the freezer for another three hours to set fully.If you have any remaining mixture left you can pour them into mini shot glasses and put a lolly stick in the centre and freeze them to make more popsicles.6. To de mould dip the popsicle mould into some warm water and they should slide out of the moulds easily. This post is in collaboration with Yeo Valley. With a blog called the strawberry fountain and just a slight obsession with strawberries these look like the most amazing pudding. They also look so easy to make and I will have to try them with my boys, thanks for sharing. I use to love making ice lollies as a child, haven't done it in years. I like the look of this way, very nice. These are great for a healthy treat - they look tasty too! Yum! I love making my own frozen yogurt treats, so delicious. These look amazing! I never think to make my own desserts so will have to give these a go! Yum, these would be super refreshing and would make nice snacks for the family. I'd love that yogurt flavor! 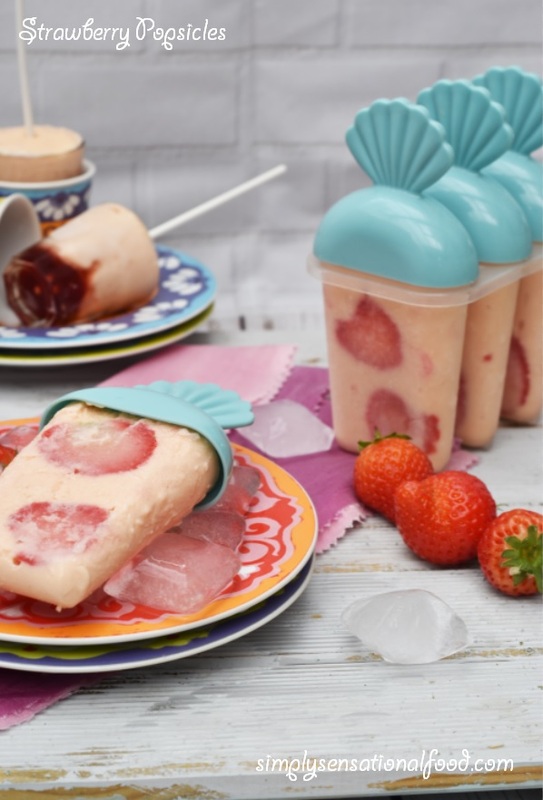 These popsicles look so cute - perfect for a kids party and not only! My kids would absolutely love these! They look so yummy! How fun are these! it's a little too cold here now for ice cream, but I will keep these in mind for summer! these look great, but for me it would have to be raspberries for them to look even better! I like the sound and look of this recipe. Looks delicious. These look really pretty. I love that you used fresh strawberry in these. I think I need to be getting Rachel to make some of these, I love icelollies especially twister lollies. Great idea - my kids lived on these during the summer holidays! These look delicious! I love popsicles! These look very delicious. I just love popsicles. 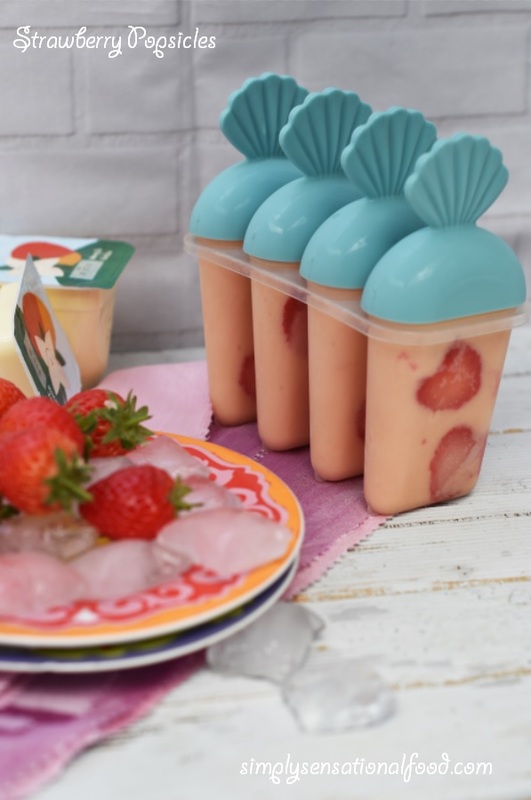 Those popsicle molds are ADORBS! And this sounds yummy! Popsicles are great snacks and what a tasty way to liven them up with fresh fruit! These popsicles look so good! I would love to have a few right now! Strawberries, custard and yoghurt is a fab combination, these look so lovely. I'll have to make these for Cooper. They sound totally yummy! Shared!! That looks like a really fantastic yummy treat, and I love that you've used agave nectar instead of refined sugar! O I miss summer strawberries! Ooh how delicious these look. I love yoghurt, frozen or otherwise. Your site is looking particularly smart. Have you had a revamp recently?